The funeral rites for the three pilots of the MI-24 helicopter took place late on Monday at Surb Sargis church in Yerevan’s Nor Nork community. Armenian President Serzh Sargsyan, Prime Minister Hovik Abrahamyan, Defense Minister Seyran Ohanyan, other officials attended the ceremony. 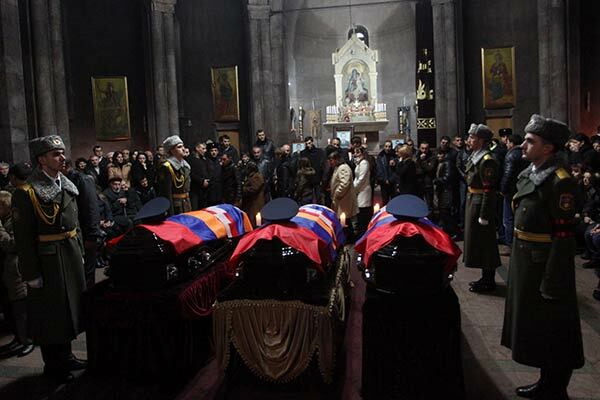 Major Sergey Sahakyan, Senior Lieutenant Sargis Nazaryan and Lieutenant Azat Sahakyan, who were killed on board a military helicopter downed by Azerbaijan near the Line of Contact in Karabakh on November 12 will be buried in Yerevan’s Yerablur Pantheon today.